Of course there is no one best hem for all sweater knits. But, for each particular fabric, some hems are better than others depending the fabric’s properties. I've done hem posts before. You already know that I use hem tape if the sweater knit is particularly bulky. I’ve been known to use a twin needle on lighter weight sweater knits. But I've recently started playing with the catch stitch and the slip stitch using self thread. Well... self yarn, actually. And by self yarn I mean the same yarn that was used to knit the fabric. You may ask “how would I get that yarn if I didn’t knit my own fabric?” The answer is deknitting your fabric (unknitting or unraveling)! Really! First, wait until the fabric is prepped. Though it’s easier to unravel the yarn beforehand, I prefer to do it at this point rather than take my chances with the yarn shrinking after I’ve sewn the hem. If there’s going to be any minor shrinking, I want it to happen to the fabric and sewing yarn at the same time, thus in the same amount. After the yarn is deknitted, I mark the hem and trim the raw edge. I finished my raw edge with the overlocker and turn up the hem. In this case I’m using a catch stitch, which is very good for sweater knit hems. The more circuitous path the yarn (or thread) takes, the stretchier the stitch will be. 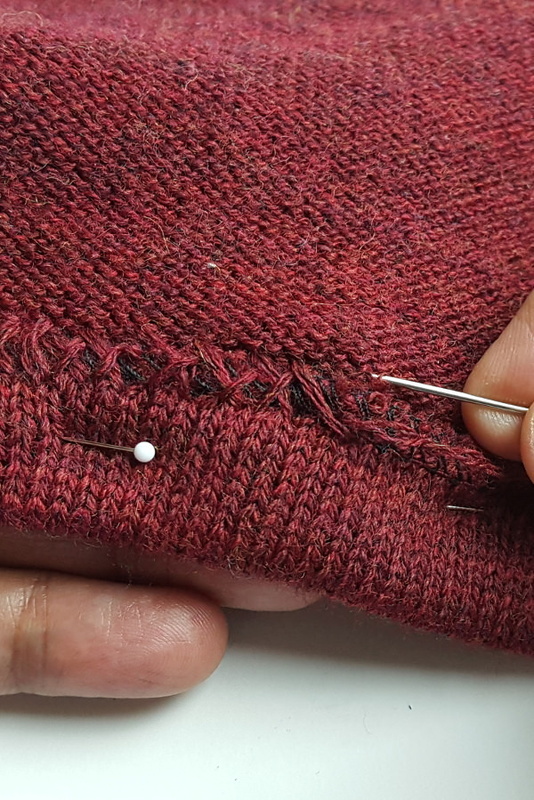 So the catch stitch, with its back-stitch motion crossing back and forth, is an excellent hem for this fabric and other stretchy sweater knits. The slip stitch works nicely if the fabric isn’t as stretchy. I like to use it if I’m using the selvage to help finish an edge as in the picture below. In that case, the extra stretch of the catch stitch isn’t needed. These methods are not used in ready-to-wear cut and sew sweater production. But if you enjoy handwork, they're some of the nice finishing touches you can use on your self sewn sweater. 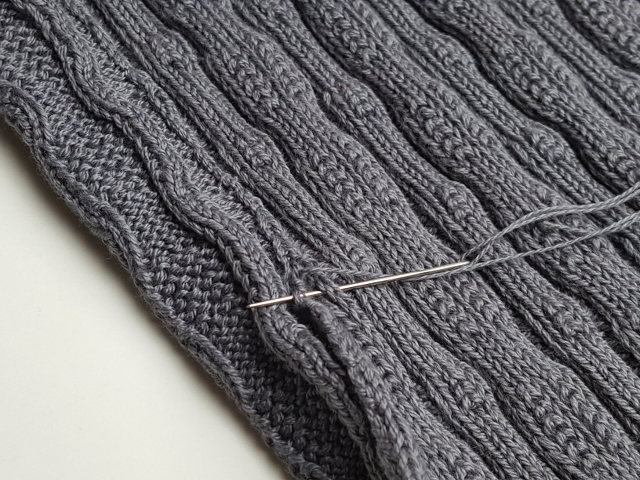 No matter which stitch you use, always finish with a good steaming. Hold the iron above the fabric and allow the steam to penetrate. Let the fabric dry before moving it and you’ve got the best hem. P.S. My online course How to Cut and Sew a Sweater opens again for registration in late September. Click for further information. Thank you! I have a unworn thrifted sweater dress that I wanted to shorten to hip length but couldn't figure out a good non-bulky way to finish the hem!